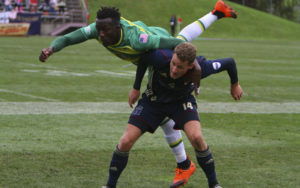 For the first time in club history, Bethlehem Steel FC defeated the Tampa Bay Rowdies, 1-0 in the regular season finale Sunday afternoon at Goodman Stadium, clinching a playoff berth in the process. 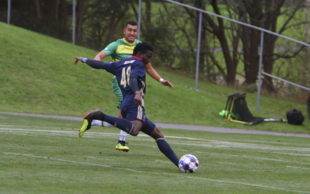 Bethlehem’s Michee Ngalina scored a clinical finish 18 yards out from Brenden Aaronson’s assist on the Steel’s second meaningful penetration into the offensive third in the 13th minute. Rowdies goalkeeper Akira Fitzgerald had no chance. Tampa Bay approached the game with the mindset of an eliminated side. They did not throw caution completely to the winds but attacked on the front foot from the opening tap to the final whistle. Bethlehem was forced to play to absorb pressure and then counterattack by Tampa’s aggressive midfield pressure. The teenage duo of Brenden Aaronson at the no. 10, and Anthony Fontana at the no. 8 were able to generate meaningful offensive threats off the counter backstopped by veteran captain defensive mid James Chambers. Bethlehem deserve credit for a thoroughly professional performance. The must-win situation dictated that they defend their lead once attained, and they did so, maintaining possession and finding the reserves of strength, endurance, and will necessary to hold off a veteran side. Tampa Bay outshot Bethlehem for the game 17 to nine. They also kept 54 percent of the possession. Steel keeper John McCarthy spent the time doing John McCarthy things with six saves and numerous cleared back passes, all taken with calm assurance that all would be well. Steel head coach Brendan Burke will be pleased with his side’s efficiency when shooting in the first half. Four of the five were on goal, with one going in. It should also be noted that six of Tampa’s 17 were blocked by Steel defenders, including two result-savers, one by teenager Ben Ofeimu and one by old man Methuselah, James Chambers. It was thoroughly fitting that the game ended with Bethlehem players signing autographs for the crowd as part of the Breast Cancer support and awareness festivity. The win set a positive tone for autographs, and the pink warmups auction raised $2,199.00. 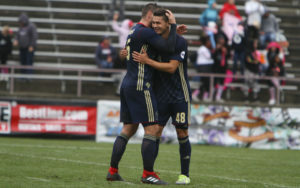 Steel FC finished sixth in the east on 50 points, highest in their short history. New York beat Pittsburgh 2-1 Sunday evening to finish fifth on 51 points. New York will travel to Charleston for the 4-5 game Saturday, October 20 at 7 PM. Bethlehem will travel to Pittsburgh for the 3-6 game, also Saturday the 20th at 7 PM. Teenagers! As has been recent practice, five of 10 field players in today’s game were teenagers, and it was the 34th different lineup this season. Ninety-eight times in the club’s 100-game existence, the lineup has been different. Last season away in Tampa, Bethlehem startled observers by starting two teenagers at the 10 and the 8. Today’s comparative nonchalance about starting five of them – LB, LCB, DCM, ACM & RW – illustrates the deepening of the program’s commitment to youth. It also illustrates new Sporting Director Ernst Tanner’s faith that focus on 16-to-21 year-olds can produce results. Centerback: All Steel fans know that centerback was a position of concern for Bethlehem in preseason. Center backs are essential to secure a 1-0 shutout as the club’s first win over a storied North American franchise. They are also essential to earning the club’s highest ever seed in the postseason. Brendan Burke used a left center back who just recently turned 18 and a right center back whom Burke has described repeatedly as a natural right back not a center back to do it. The centerback problem is a problem no more. A process: School is a process and if it succeeded you are ready to leave it behind as graduation approaches. In a roughly similar way, Bethlehem Steel FC is also a process. Its veterans must be ready to move on, taking with them their improved skills both physical and mental. It is ironic but wonderful that the last three players still signing autographs for fans at the end of Brest Cancer Awareness day were three veterans who have given so much to this year’s team, and who have come so far as players and people. P. S. Goodman Stadium may have witnessed a moment of transition in soccer’s history. Thirty-six year-old Joe Cole subbed on in the 85th minute for what may well have been his last minutes as a player. As Douglas MacArthur once said, “Old soldiers never die, they just fade away.” According to those who know, that is Cole’s preferred manner of exit. Tampa Bay Rowdies: Akira Fitzgerald; Hunter Gorskie, Pape Diakite, Tarek Morad; Martin Vingaard, Lance Rozeboom (Alex Morrell 64’), Afrim Taku (Joe Cole 85’), Kwadwu Poku (Jaime Chavez 64’), Leo Fernandes; Sebastian Guenzatti, Leo Taylor. Unused Substitutes: Cody Mizell;, , Max Lochowecki, Zac Portillos, , Michael Nanchoff.